National awardee TK Bharani is one of the last artists to carve on sandalwood, and craft micro rice miniatures. National awardee TK Bharani is one of the last artists to carve on sandalwood, and craft micro rice miniatures. 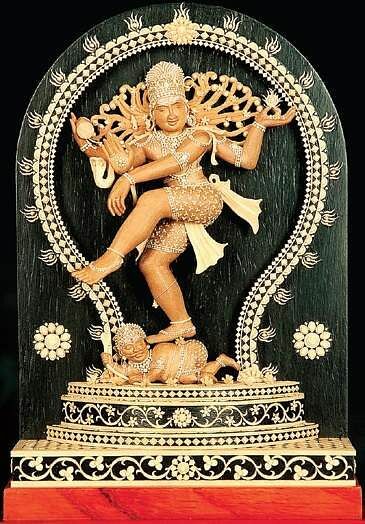 His creations range from Swami Vivekananda carved on half a rice grain, to a four-feet tall Shiva in a dancing pose. CHENNAI: It has been 33 years. Thousands of projects have been successfully completed so far. But TK Bharani’s persistence to chisel every piece of sandalwood to perfection continues to remain the same. The third generation craftsman was conferred with the prestigious Kamala Award for Excellence in Craftsmanship last week. We speak with him as he effortlessly carves a flower out of a leftover piece. “My grandfather started rice carving, then my father TK Kalastri innovated sandalwood carving. It is an art learned through just observing and replicating. I have learned only one per cent. My son also does carving now,” shares the master craftsman. The Chennai-based artist has been invited by many universities from different countries to train their students. But he couldn’t pursue because of the language barrier. “I would be happy if every craftsman gets the recognition he deserves. Why not value an art that is native to your country? Given a chance, I would love to compete in a global level,” he shares. Bharani, who currently stays in Thirumazhisai, works mainly with soapstone, rice, and sandalwood. All his sandalwood are predominantly sourced from Bengaluru. “Now the material is very much in demand. I wouldn’t mind stocking up even 10 kg or buying in an auction. I also have plans of using shreds of the waste wood. Like sand art, these wood shreds can be ground and used as a replacement material,” explains the craftsman. The artist is currently working on a four-feet high chariot that will have faces of all the mythological deities. Lord Ganesha is one of his hot-selling pieces. So he has made it a ritual to make a small mold of Lord Ganesha before starting all his works. Call it superstitious, but Bharani always looks for an auspicious time for starting his projects especially while carving the face portion. “If you notice, the eyes of idols are constantly shut in my pieces. Unless people specify that it is for a showpiece in the living room, I don’t keep the eyes open in my work,” he adds. The artist uses nothing more than three varieties of steel blade, umbrella ends and cycle spokes for carving. His work mainly revolves around idols of gods and temple gopurams. Some of his famous works spread across Meenakshi Sundareswerer Thirukalyanam, Geethaupadesham, scenes from the Indian epics — Mahabharata and Ramayanam. 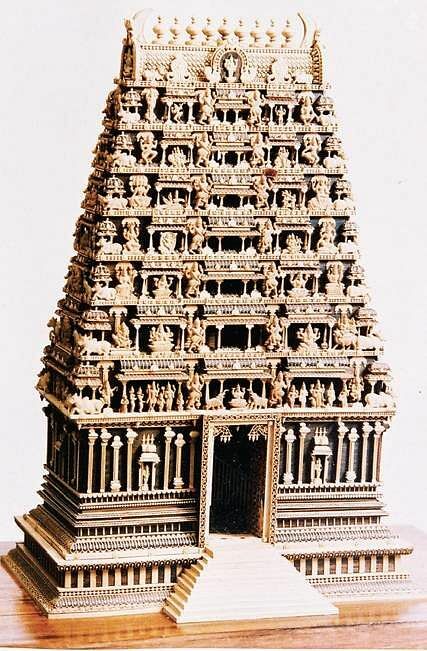 He has also made an exact replica of 1,000-year-old gopuram of Brihadeeswara temple in Thanjavur. “I never take an advance amount. If people are not satisfied with the output then I take the piece back. Unless its a personal figurine that cannot be sold to another person,” says Bharani while showing us his micro rice carvings of M Karunanidhi, Anna Durai and J Jayalalithaa, all made of one rice grain. Bharani does not use any lens to capture the nuances. His mental representation of what he wants and an eye for detailing reflects the moment he starts chiseling. “Like every art, you need peace of mind to achieve the design you want. I wouldn’t mind discarding a whole piece if it’s not perfect. Because if not for this art I wouldn’t have gotten an identity,” says Bharani. 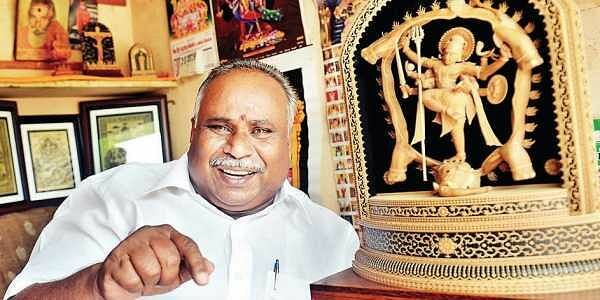 Bharani magically believes that if an idol has been exactly replicated then it can move. “If a horse that I make moves by an inch then I can say that I have brought a life into it. Every two piece of the same idol I make must look alike. People must take it home with a happy heart or they will not come again,” he says. Bharani has been part of various exhibitions and presentations held in New Delhi, Mumbai, Mysuru and to an international exhibition in Greece. He has two dreams — to master the eyes of Japanese Buddha and to make a four-feet masterpiece chariot.